Please fill out the following form and click SUBMIT to send your application to our office. We will review the information and be in touch with you as soon as possible. Using the TAB key on your keyboard will allow you to jump from one field to the next within the form. The time to fill out the form is approximately 20 minutes. This application will remain active for 30 days. If you are interested in being considered for employment after that time, please complete a new application. 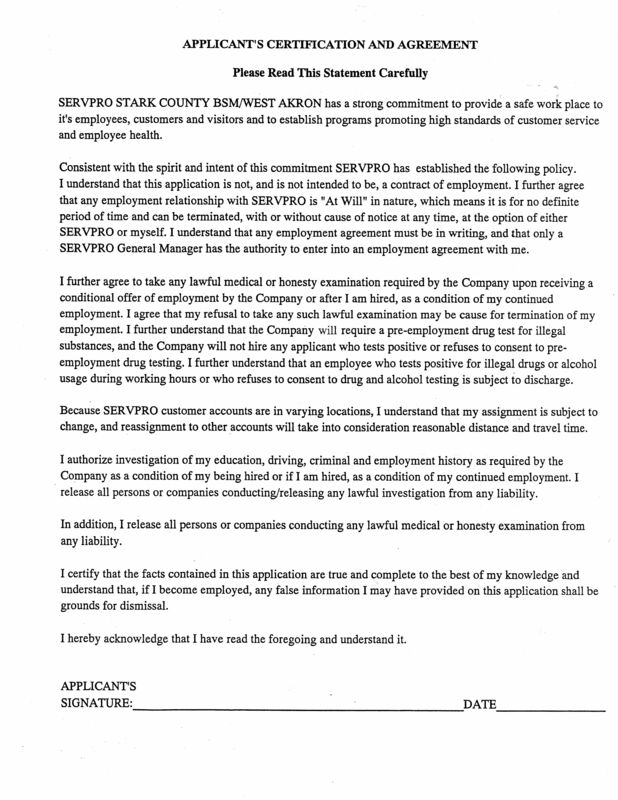 Were you employed by Servpro of Stark County - BSM or Servpro of West Akron before? Are you a U.S. citizen, or are you otherwise legally authorized to work in the U.S. without any restrictions? Are you capable of performing the essential functions of the position for which you are applying? If not, what essential job functions would you not be able to fulfill? I have read the Employment Agreement Statement.